Every single year, I love to bake and ice sugar cookies for Halloween. 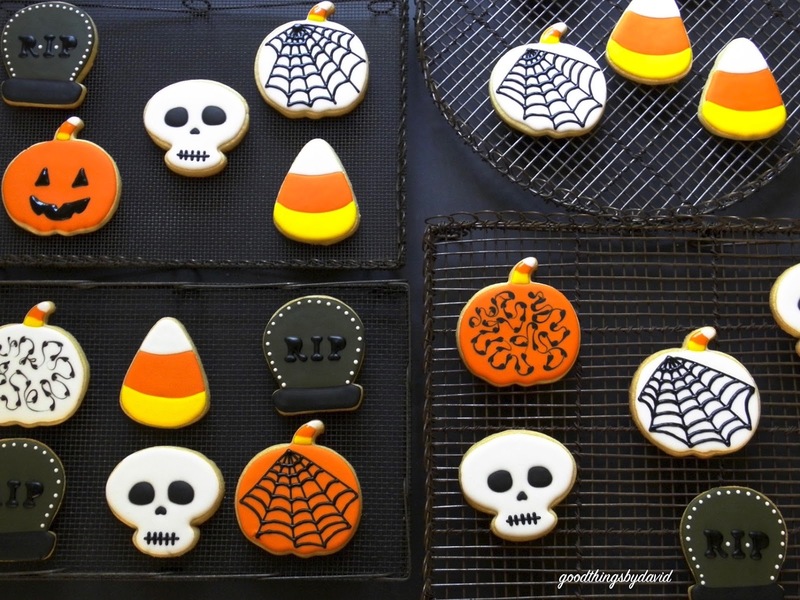 Whether they're meant for trick-or-treaters or for individuals who are near and dear to me, I make sure to create cookies that are colorful, a bit spooky, and infinitely delicious. 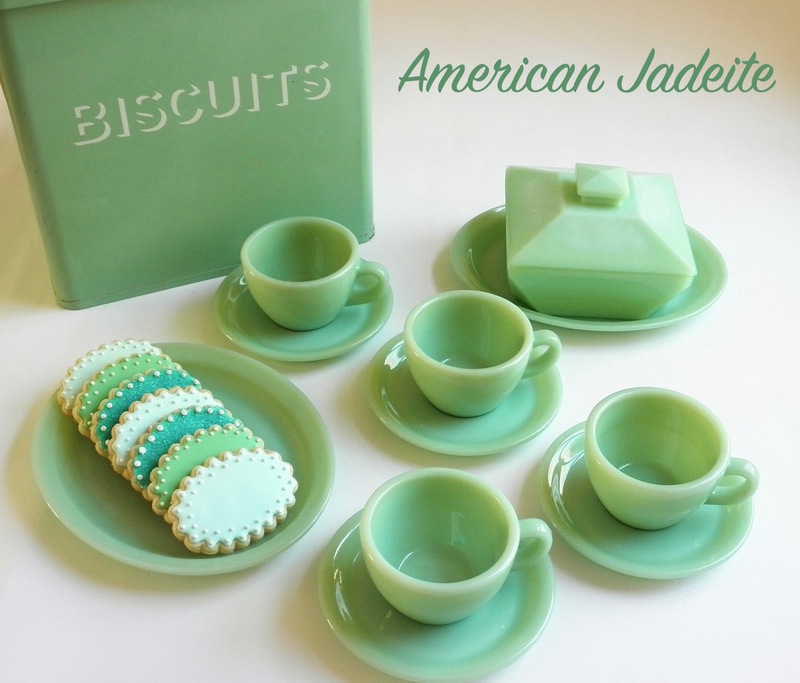 It's nice to see people devour one of my cookies in a few bites, and then tell me that it was so good. 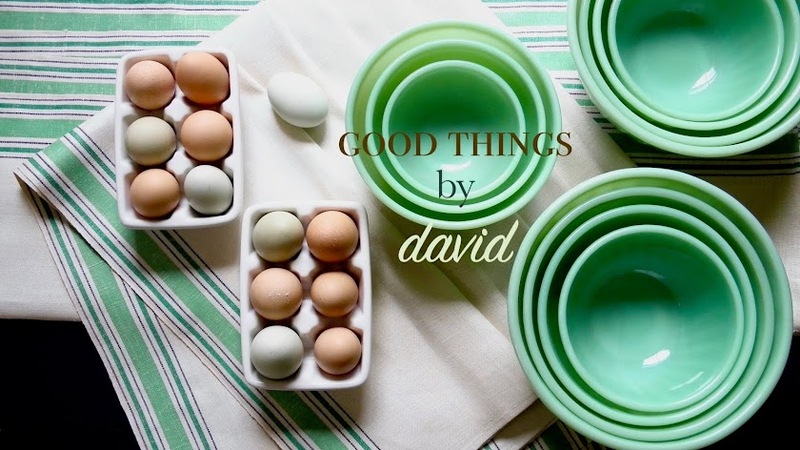 This is what every baker strives for! This year I baked dozens of cookies with some new cutters that I recently purchased. 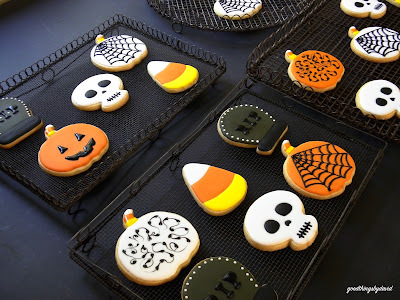 With a little help from the Sweet Sugar Belle shapeshifter cookie cutters found at Michael's, I cut out and baked many toothsome Halloween cookies for some people in town. I love the triangular cookie cutter that makes those wonderful candy corns, along with the skull and tombstone cookie cutter shapes. The large pumpkin shape (not part of the set) is one that I've had in my pantry for many years, and every Halloween, I always reach for it because it makes such a great cookie. 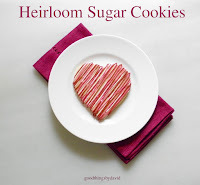 For this project, you can either use my Heirloom Sugar Cookie Recipe or my very delicious Sugar and Spice Cookie Recipe for the base. A couple of batches of royal icing, some gel paste colors in black, orange and lemon yellow, and you're on your way to making treats worthy of your Halloween party. The candy corn cookies are so adorable. 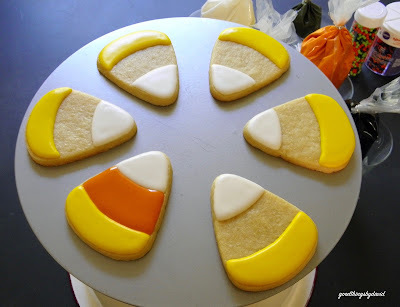 I actually am one of those people who loves candy corn. 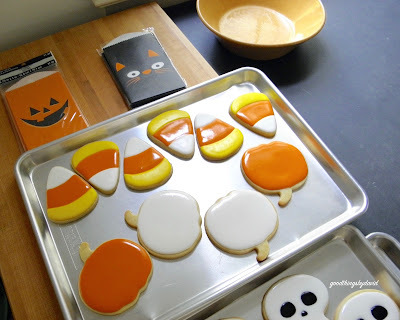 In fact, I like to pick out the pumpkin candy corns and keep them all to myself because I like them so much. 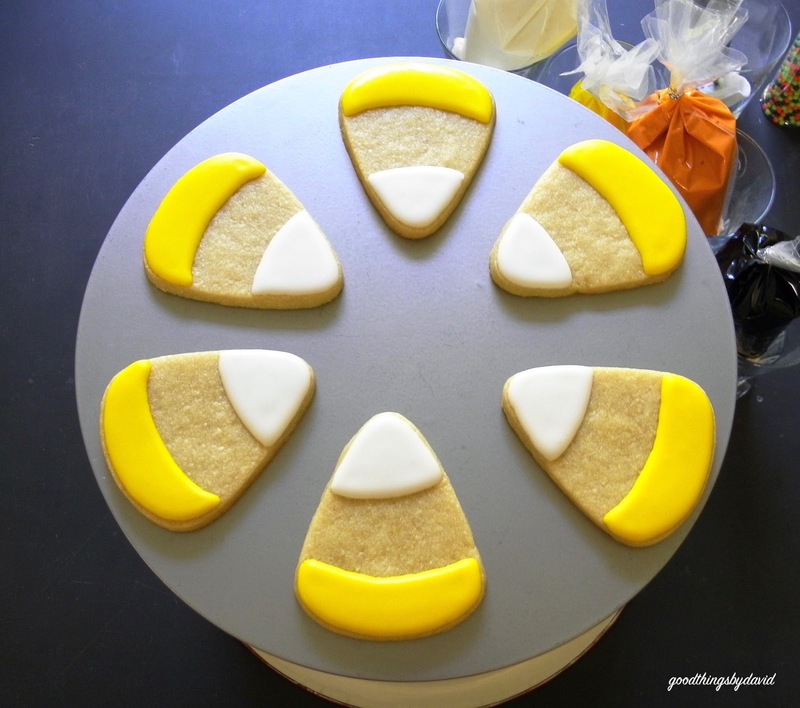 Ice the top area in white royal icing and the bottom area in a bright-yellow royal icing. Let the icings set for at least one hour. Ice the middle part of the candy using a tasty orange-colored royal icing. Let the icing dry completely. This is the cookie: easy, peasy!! Cut out the skulls using that wonderful shape, and with the stencil provided in the kit, trace the eyes and nose using a food-writer pen. Using a #1 piping tip and some black royal icing, outline and flood the eyes and nose. 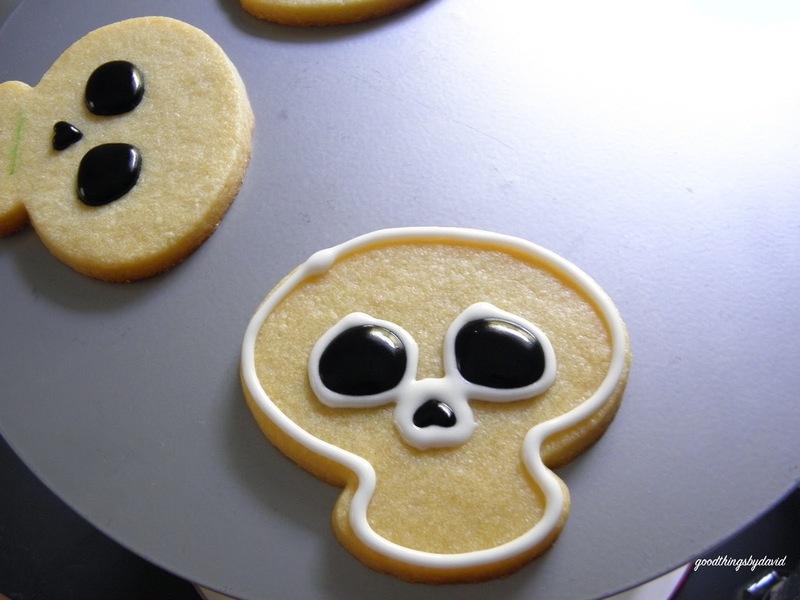 Using the white royal icing and a #3 piping tip, outline the shape of the skull, and outline the eyes and the nose as shown. You want to provide a dam for these areas so that the colors stay put. 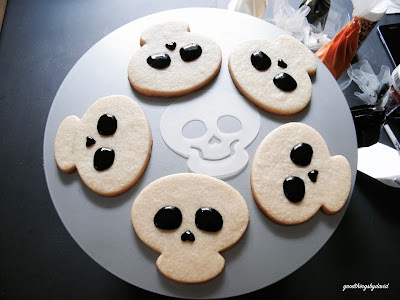 Immediately flood the rest of the skull in white royal icing and let the skulls dry completely. 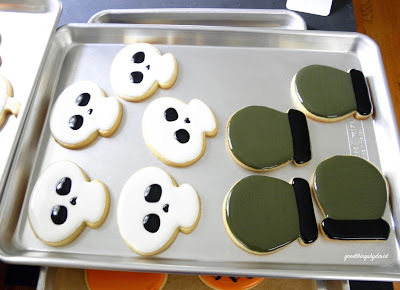 For the pumpkin cookies, I outlined and flooded the bases in either orange or white royal icing. 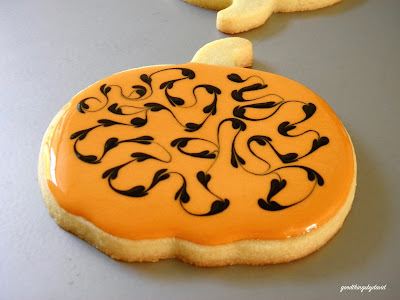 Some pumpkins were then immediately enhanced with some black dots, which were then swirled with a decorator's modeling tool. I LOVE this effect. Other cookie bases were left plain. Once the bases were dry, I then piped spider webs with some black royal icing. 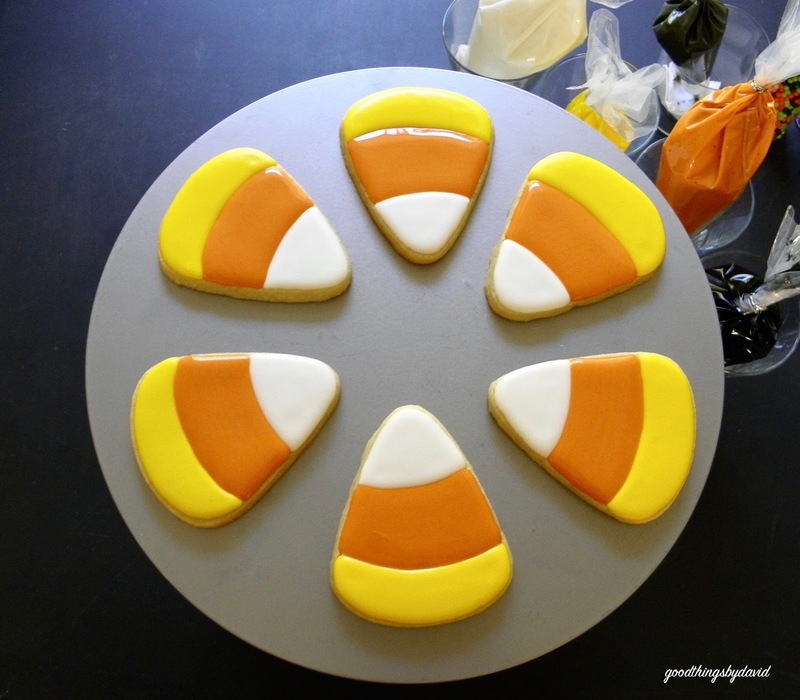 My favorite part of all of the pumpkins was the "candy corn" stem. Aren't they cute? While I was in the middle of this cookie decorating project, I was edgy because the royal icing was taking longer than normal to dry. 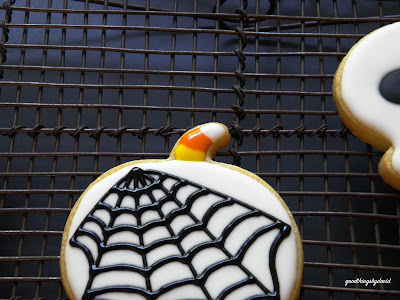 Due to the humidity and our warm temperatures, my royal icing has not been happy lately. If you experience this same problem, dedicate a small tabletop fan to speed up the drying process. The tombstone cookies were given a black bottom and a gray-colored top as shown. Pipe these areas with either a #3 or a #4 plain piping tip. Let the bases dry completely. 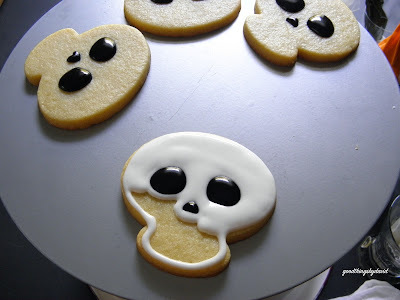 To finish the skulls, use a #1 piping tip and some black royal icing to pipe the mouths. The tombstones are given a R.I.P. 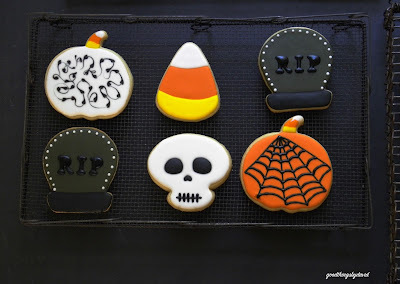 decoration with a stencil and some black royal icing. White dots are added to the perimeter of the cookies. 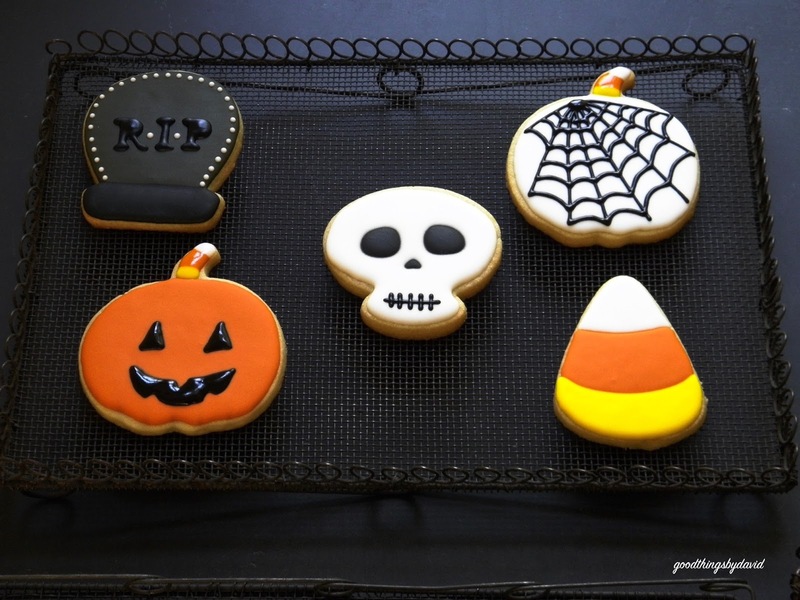 Nothing could be easier than a set of these Halloween sugar cookies. Presented on antique and vintage wire cooking racks like these, anyone's Halloween party will be off to a good start. 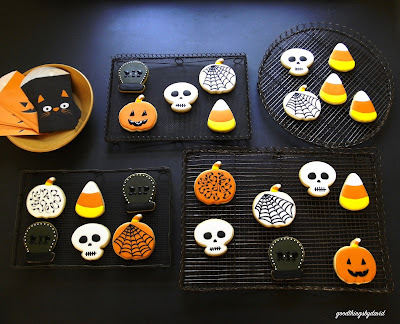 If you want your guests to take these treats home with them, provide a set of some jack-o-lantern and kitty cat treat bags in a bowl, so that each person can package up their treat(s). From my home to yours, have a safe and Happy Halloween this year!